Ep05 began on a rainy day when Takuma and Natsume were caught outside of an old house, one that belonged to a girl named Taki. 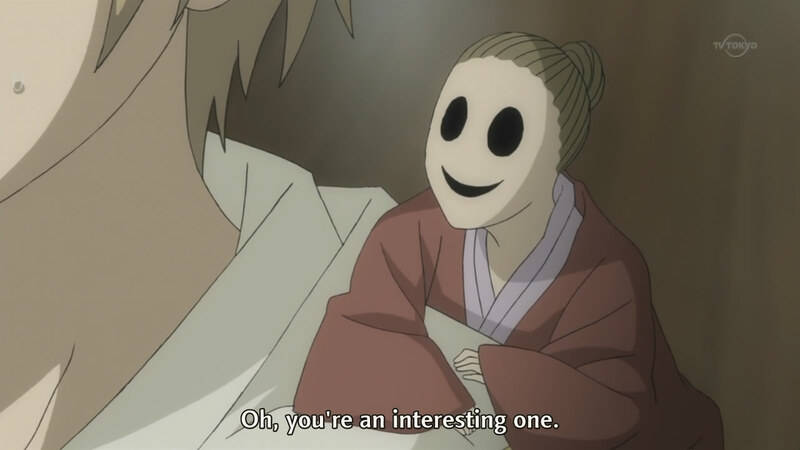 She seemed to be well-acquainted with Takuma and Natsume, but I had no idea who she was. The perils of not having Google...! Anyway, the two boys offered to help Taki clean up the place - specifically, the storehouse - since she had given them refuge from the rain. Since Taki's grandfather had been highly interested in spirits and exorcism, the storehouse was full of items to ward away malicious demons. It turned out that, while not being able to see spirits, there were many demons that often dropped by the house to see Taki's grandfather, being very interested in him. Although they wouldn't admit it, even at the end, they really ended up caring about the deceased man. The strife in the story had to do with a "nasty demon" that Natsume had unwittingly released by taking off the upside-down picture of a kappa, which had acted as a seal for the demon. Taki's grandfather himself hadn't know about the demon when sealing it away. 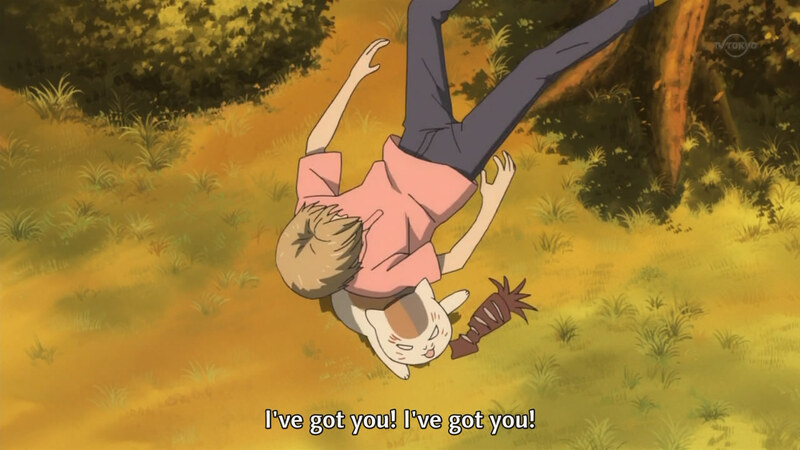 As Natsume ran around the house, attempting to keep the demon from reassembling the pieces of its body (as the seal had destroyed it and caused the pieces to fall all over the house), it was interesting to see how much trust and faith both Takuma and Taki had in him. Despite his actions obviously being weird, the two of them never once accused him of lying. While that's a sign of maturity, it's also a sign of friendship. In the end, the malevolent demon was banquished and the plethora of demons that used to visit Taki's grandfather said their goodbyes to an emotional Taki. It was really just a "feel good" episode. How do you survive that kind of fall?! 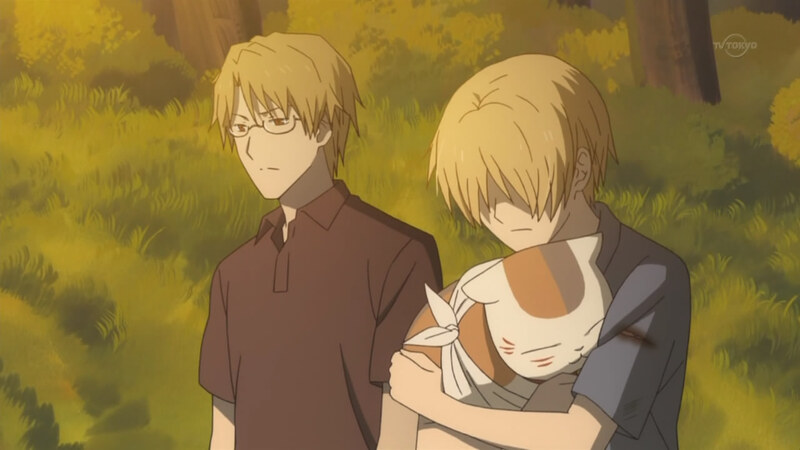 Ep06 was the start of the mini-arc, with Natsume and Nyanko-sensei attending a summer festival where Natsume bumped into a bleeding demon. While following the trail of blood she had left behind her, he stumbled upon an old shrine house where the demons inside were badly beaten-up. 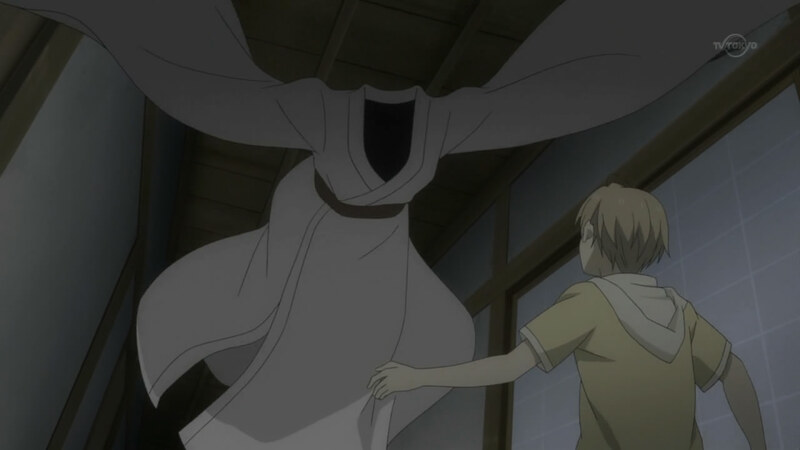 Natsume was attacked suddenly and only got away because a winged demon grabbed him and flew off. 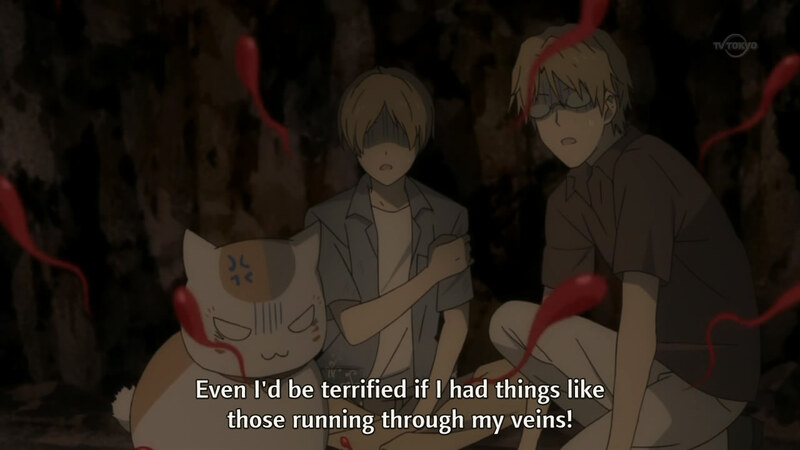 After a questionable (though amusing) scene of the demon dropping Natsume in surprise after finding out that he was human and Natsume landing safe and sound (onto Nyankyo-sensei), the demon revealed that there was someone in the area attacking demons and draining their blood. She initially asked Natsume for help, but he hesitated because the demon sounded too frightful to get caught up in (especially when he was trying to protect his life with Touko and Shigeru). In usual Natsume-style, he ended up wanting to help anyway. While canvasing the neighbourhood demons to see if they knew something, the conclusion was reached that it was actually a human that was drawing the blood. After an innocent passing with a suspicious man on the street (one that made Nyanko-sensei's fur stand on end, actually), Natsume ran after him only to encounter him attacking the demon from before (with a man-made demon of his own). 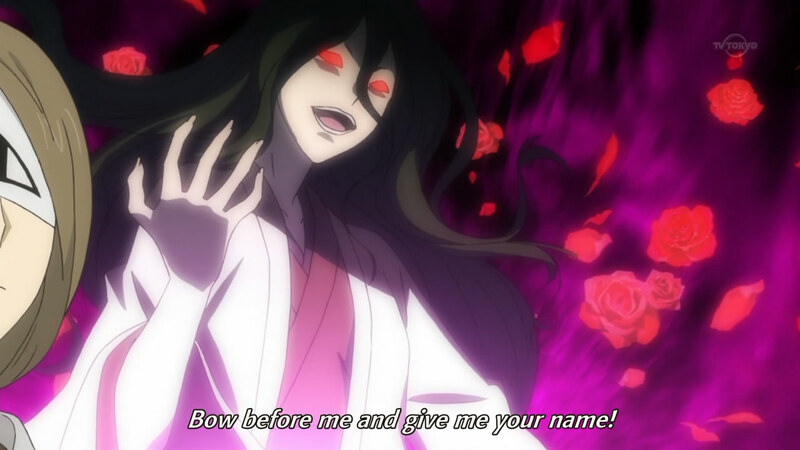 It turned out that was Matoba Seiji, the leader of the Matoba Clan from episodes past. Throughout the arc, his suspicious actions would cause him to be the prime suspect for Natsume - although, it's pretty clear that that would be a little too simple. 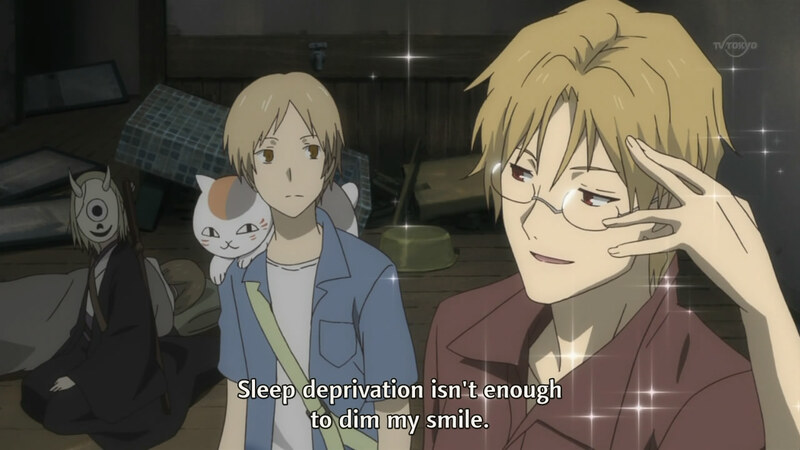 Either way, he still kept attacking Natsume throughout the episode until the previously-seen exorcist Natori showed up to help out. While I remember nothing about this man, I do recall that shadowed lizard that crawled around his body; I always thought that was an interesting touch, and it's nice to see him return. There's never any appreciation for Nyanko-sensei. Ep06 ended with the introduction of the real culprit (although that wasn't revealed until later). Natori and Natsume headed to a nearby village, where there were rumours that Matoba was hanging out. It was curious that Nyanko-sensei came along, but Natori specifically had Hiiragi (his demon) stay back, under the pretense of taking care of the injured winged demon. Either way, the two ended up staying at the same inn as Matoba (due to a landslide occurring just as they arrived to ask about the man). 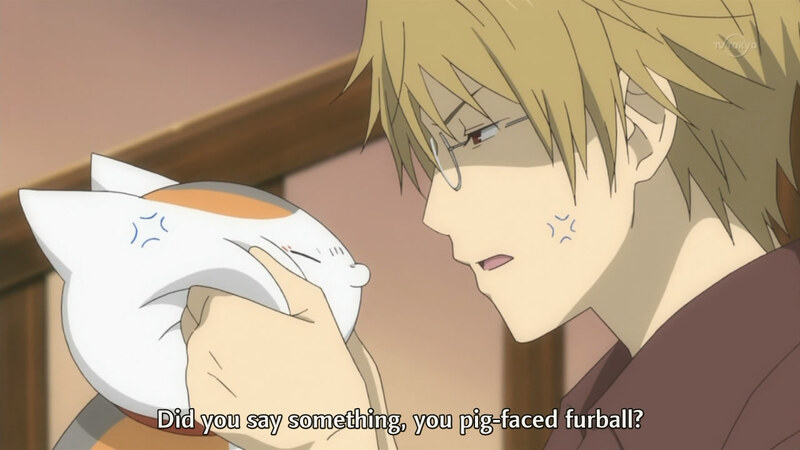 It was quite clearly a trap, since the long-haired woman attacked right after both Natori and Nyanko-sensei were out of the room. Just as Natsume escaped her clutches (and she quite clearly was going to take his blood, after announcing it), he ran into Matoba, who had his demons capture him. Matoba showing up spilled the last bit of blood needed (as Nyanko-sensei was "accidentally" pierced with an arrow), but the demon ended up not being useful to either party. It wouldn't listen to the witch and it couldn't be subjugated by Matoba due to its inability to speak (and, ergo, form a contract, apparently). The last little bit of the climax was Natsume getting caught while attempting to lure it into Natori's exorcism circle, and Matoba coming to his rescue (albeit by harshly destroying the demon). The "moral" was just as Matoba had said earlier in the episode; he was willing to let a handful of demons and humans get hurt in order to protect the majority. 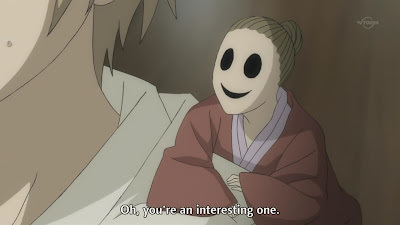 The episode (and arc) ended with Natsume sadly thinking about the different kinds of feelings and motives that drove the various parties and, of course, Matoba cryptically stating that Natsume was very intriguing (especially after finding out that he was Reiko's grandson). I expect to see him again in the future (eventually). Even though I waited three weeks so I could watch these episodes in tandem, I inevitably find myself wanting more almost immediately. 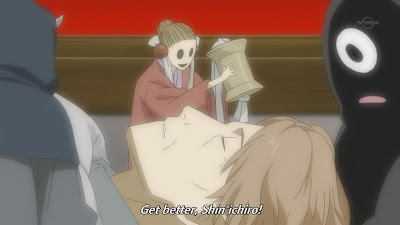 It's strange how I can like this anime so much and yet not remember key plot points from previous seasons, but I can't deny that the re-entrance of Natori has made me want to go back and watch relevent episodes. I'm so hooked.